The Grand Central Chorus is an enthusiastic group of more than sixty men from the East Midlands, who love singing together in four-part close-harmony, in Barbershop style. See map. (nb. use the Derby Road entrance to the school campus). 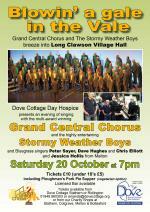 Local charity get "a Grand" from Grand Central Chorus! Want Grand Central Chorus to sing at your next function? Why not hire Grand Central Chorus to entertain at your next event? We can perform at corporate functions, charity events, community entertainment events, birthday parties, christmas parties, awards nights, weddings, engagements, anniversaries, engagements, and even funerals and memorial services.